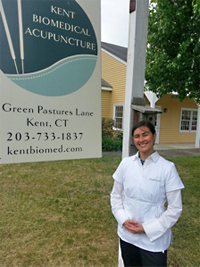 Fair Skies Acupuncture is a small, friendly and picturesque office located in Kent, CT and serves Litchfield, Fairfield, Duchess and Putnam counties. We offer a wide array of services including Acupuncture, localized Tui Na and Massage, Hot Stone Trigger Point Therapy; Warming Methods; E-Stim, Cupping and Gua Sha. We share dietary, lifestyle, and exercise suggestions. Available: doTERRA Essential Oils; Head, Neck and Facial Massage, Facial Rejuvenation Acupuncture and Massage, and Sacred Stone Therapy.